With Blue Vista Villa, you get amazing views of the Salt River National Park and the Caribbean Sea. A large pool gives you time to swim when you want to share time with people lounging in the hot tub, but during the day you might want to take a ten-minute walk down to Columbus Landing beach (or a two-minute drive). Board games can offer a chance to enjoy some family fun out of the sun. Two couples or a family with children can enjoy Blue Vista Villa comfortably, especially since baby equipment is available for your use. Blue Vista Villa is a 4-bedroom, 4.5-bath home that sits hilltop overlooking the Caribbean and the historic site where Columbus first landed in the new world. 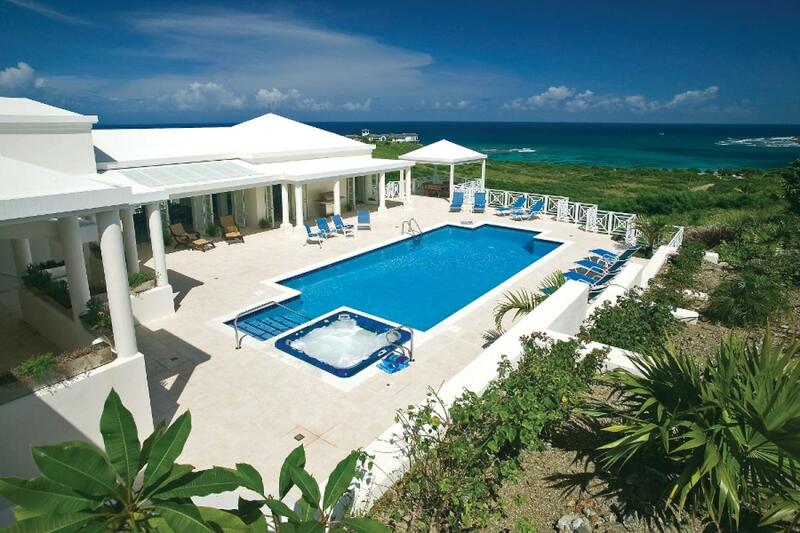 As guests enter the mahogany gate, they are greeted by the large pool, Jacuzzi, and the covered dining area where one can enjoy the view out to the blue Caribbean and all the way to Buck Island. Through the French doors from the pool deck is the dining room with a table that sits 12, and Great Room with conversation areas, correspondence desk, and satellite TV. The fully equipped gourmet kitchen is just down the hallway that leads to the bar area complete with satellite TV and internet. For the guest that must work, there is a full office including fax, printer, and satellite internet on the lower level. Each bedroom has a private deck or patio, full bath en-suite and AC. Blue Vista is furnished in West Indian plantation-style with woods and soft colors. The caretakers are on the lower level and are there only if needed; their main concern is guest total privacy.